Recently the Prayer Shawl Group donated 73 blankets to our Linus representative Cindy. 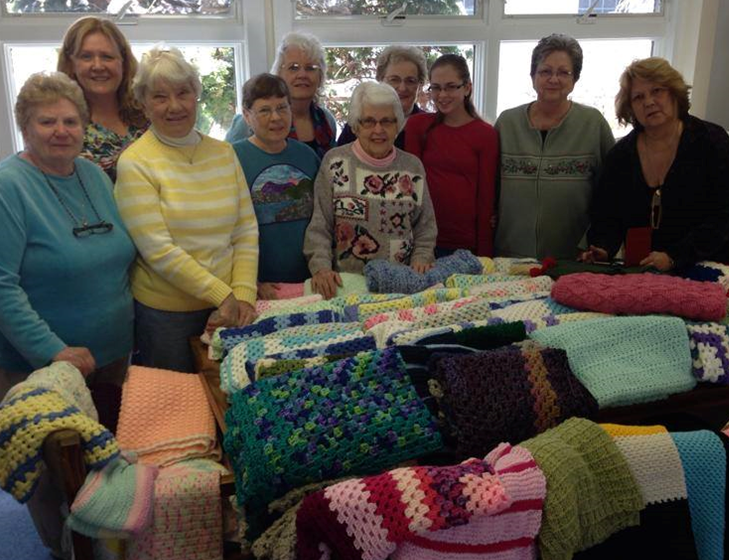 All of the women pictured were a part of knitting or crocheting these donated items. So many good stories come back to us when we give these blankets. Or you can join the Knit Togethers! They meet next on May 12, June 9 and June 23. In April, Keith Walleck donated over 170 skeins of yarn and 20 pairs of knitted mittens in memory of his mother, Janet Nelson. The knitters are very pleased and are busy working on converting the yarn into blankets for nursing homes, baby blankets, and mittens for our mission. Thank you, Keith, for your generous gift and for helping us in our mission to give to the community. Our meetings are held on the 2nd and 4th Mondays, 10am to 11:30am, in Lounge 15. For information contact Norean Radke or Lois Ostling.